Many attribute the rise of carpal tunnel syndrome (CTS) to poor computer ergonomics or uncomfortable body positioning for long hours. Carpal tunnel syndrome symptoms include hand weakness, numbness and/or tingling of thumb and fingers and pain from the wrist area throughout the palm side of the forearm. Although similar symptoms to carpal tunnel syndrome may arise from different types of work with arms and hands poorly positioned, if those symptoms dissipate quickly and easily it’s probably not carpal tunnel syndrome, at least it’s not serious. Simply taking breaks, and shaking your arms and hands, then re-positioning your hands, arms, and general posture better should keep you from needing medical intervention. 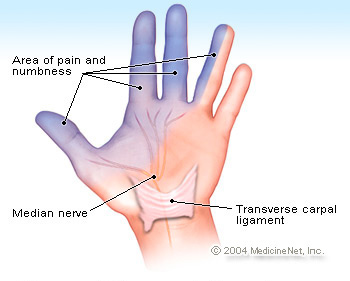 The carpal tunnel is a tube bound by bones and ligaments in the wrist area on the palm side of the hand. It is roughly the diameter of the thumb, and it houses nerve, veins, and tendons for hand and finger mobility. Essentially carpal tunnel syndrome pinches the median nerve, blood vessel, or tendon damage in the carpal tunnel. Conventional medicine offers adjustable splints that can be taken off and on at will. Many carpal tunnel syndrome sufferers wear them during work, but wearing the splint during sleep is also recommended. Non-steroid anti-inflammatory drugs (NSAIDs) are usually recommended. Some have to be prescribed while others can be purchased over the counter – Ibuprofen, Advil, Aleve, etc. These only relieve pain with side effects. Sometimes cortisone injections are used to relieve the pressure and pain. If these don’t help enough, surgery is recommended. Sixty-four sufferers of moderate carpal tunnel syndrome were divided into a control group receiving vitamins B1 and B6 with fake acupuncture. The other group received two acupuncture treatments weekly over a four week period and wore wrist splints nightly. This entry was posted in Acupuncture, Acupuncture and Pain and tagged acupuncture, arm pain, carpal tunnel, finger pain, wrist pain. Bookmark the permalink.